Here’s a list of a dozen fabulous picture books. I’ve chosen them for different reasons – humour, language, meditation etc. All books are suitable for 2-6 year-olds, and I’ve specified below if there’s a different age group. Rhyme and wit – The highway rat written by Julia Donaldson, illustrated by Axel Scheffler. While I almost became tired of Julia’s books because I read them so often to my kids and the rhythm started to sound the same, this is my favourite one. It’s based on an old poem, ‘The highway man’ by Alfred Noyes. Compare the poem to the picture book. Poem – ‘The highway man came riding, riding, riding, The highway man came riding, up to the old inn door’. Picture book – ‘For I am the Rat of the Highway, The Highway – the Highway – Yes I am the Rat of the Highway, and whatever I want I take’. It’s worth reading the poem to kids to compare to the picture book. The poem is a little gory and a little sad so while I’ve just suggested you read the poem to your kids, you may have to be selective about which verses to read, depending on the age of your kids! The duck makes for a wonderfully witty hero. Humour – Pete the sheep written by Jackie French, illustrated by Bruce Whatley. My three kids thought this book was hilarious. Sheep, haircuts, dogs, shearers. Pete is a sheep dog – except he is a sheep – which makes him a sheep-sheep. ‘”Baa” said Pete politely, which in sheep talk means, “Hello, delighted to meet you. Madam, please step this way.”‘ A funny ending with no words but a humorous picture. Beauty – Blueberry girl written by Neil Gaiman, illustrated by Charles Vess. Every baby girl should have this one read to her. It is a prayer for an unborn daughter. The sincerity and love behind these words are so beautiful. This is what I wish for Miss 9 – ‘words can be worrisome, people complex, motives and manners unclear, grant her the wisdom to choose her path right, free from unkindness and fear’. It would be just as suitable for a year 12 graduation present as it would be for a baby girl. It may not be your child’s favourite book because of the adult concept but the language is beautiful so it is lovely for kids of all ages to have those words floating through their heads. Rhyme and perseverance – Monsieur Albert rides to glory written by Peter Smith, illustrated by Bob Graham. I love reading this book aloud, probably because I can practise my French! There are many French words in here so if you are a French aficionado, this one is for you. And if you have forgotten all your high school French, it’s a rhyming book so you can easily work out the pronunciation based on the rhyme! ‘”You’re mad, Monsieur Albert, you haven’t a chance!” cried a gendarme (that’s just a policeman in France). ‘”Bonne chance!” shouts a fisherman down by the Seine. “Good luck, Monsieur Albert! (They all know his name. )’ This is a tortoise and hare type of story, where Monsieur Albert (don’t pronounce the t on the end of his name – Alber!) gradually overcomes the obstacles in his bike race. Language – On the night you were born written and illustrated by Nancy Tillman. I bought this book for Mr 6 when he turned one. Perfect baby present, too. Read the first page aloud now – ‘On the night you were born, the moon smiled with such wonder that the stars peeked in to see you and the night wind whispered, ‘”Life will never be the same.” Because there had never been anyone like you …ever in the world.’ Gorgeous illustrations. Mr 6 still likes me to read it to him because it makes him feel special. Problem-solving and humour – Too many elephants in this house written by Ursula Dubosarsky. Mr 6 loves elephants and he loves this story. A little boy has so many elephants that his mum is annoyed because they are taking up too much room. But he loves them because ‘the elephant in the living room helped him build towers with his blocks. The elephant in the kitchen was good at making toast. He could play hide and seek with the elephant in the hallway. The elephant in the bathroom always reminded him to brush his teeth.’ Rather than getting rid of the elephants, the little boy thinks of an ingenious solution. Fun illustrations. Creativity – Milli, Jack and the dancing cat written and illustrated by Stephen Michael King. He is one of my favourite picture book author/illustrators and this is my favourite book of his. It oozes creativity and at the centre of the story is a girl who is creative but is forced to fit in with everyone else – ‘So, instead of doing what she loved most, Milli spent her days making brown shoes, black shoes and plain, ordinary work boots. Night after night Milli dreamed she was brave enough to show everyone what she could really do. But day after day was the same as before.’ That is, until Jack and his magic cat roll into town. Love how even in a picture book, creativity and courage are connected. Problem-solving and humour – The duck in the gun written by Joy Cowley, illustrated by Robyn Belton. This is a more complex situation so may be suitable for 4-7 year olds. The General and his men want to aim their gun at the town but there’s a problem. There’s a duck in the gun. The General speaks to the Prime Minister of the town. The PM says,'”You’ll have to put the war off for three weeks. By that time, the duck will have hatched her eggs, and you will have your gun back.”‘ This is the type of strategic thinking that goes on in this book. It’s very clever and the ending has a nice twist. Fun and interaction – Press here written and illustrated by Herve Tullet. Perfect for babies because it is so simple with bright illustrations and perfect for 2-5 year olds because it requires interaction. Like this – ‘Perfect. Try shaking the book …just a little bit. Not bad. But maybe a little bit harder.’ It’s impossible to do justice to this book without seeing the pictures. A great book for kids who aren’t attracted to books. 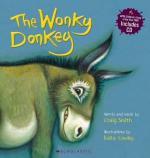 Fun and humour – The wonky donkey written by Craig Smith, illustrated by Katz Cowley. Ours came with a CD, which is worth hunting down. Ridiculous, hilarious story, which requires kids to memorise the lines if they want to join in. Try it for yourself – ‘I was walking down the road and I saw a donkey. Hee haw! He only had three legs, one eye, he liked to listen to country music, he was quite tall and slim, he smelt really, really bad … and that morning he’d got up early and hadn’t had any coffee. He was a cranky, stinky-dinky lanky honky-tonky winky wonky donkey.’ Warning – your kids may love it so much that you may listen to the CD constantly and therefore in time, you will not love it so much! I hope this list helps with your Christmas shopping. If you find it useful, perhaps you might consider subscribing to my blog or passing the link on to friends. Thanks so much for your support and all your feedback!